THE city's biggest souvenir arcade located adjacent to the New Market is currently witnessing a slump in its sales thanks to the growth of similar malls and the deteriorating situation in terms of law, order and economy in the recent years. This market, also known as the Singapore market, offers a wide range of imported products and a few local products. The items that are offered in these shops are crockery, cutlery, electrical appliances and utensils. The imported items from Thailand, India, China, France, Italy and Germany, are bought from wholesalers in Nawabpur, Chawkbazar, Baitul Mukarrum and the Stadium. Customers choose a product according to type and quality regardless of whether it is local or imported and the level of prices depend on bargaining between shopkeepers and customers, added the shopkeepers. “Sales are very bad,” said Alamin, a salesperson, “The fact is there are now more markets than customers.” Referring to customers' preferences, he said that it depends on the type of product. “If a microwave is locally made, most customers would not prefer it, thinking it would be of bad quality,” he added. Rajib, another salesperson of a crockery store, said that sales are less without being able to specify the reason but he added that imported crockery are comparatively cheaper than local ones. 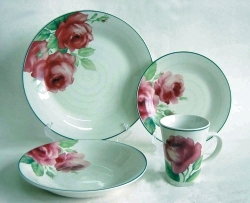 “Imported crockery have bad quality and bad finishing so customers prefer local ones,” he could not particularly say why but he denied that the imported items were rejects. “We cannot make good sales because of hartals,” said Alim, a salesperson from a store that deals in local and imported crockery. “ Customers would prefer anything whether it is local or imported but if there is a hartal, they don't venture out and we keep our shops shut,” said Mintu, his fellow salesperson. Mohammad Jalil, owner of a crockery store also emphasised thar sales are very bad and attributed it to the deteriorating law and order situation combined with the bad economic situation. “I used to have a lot of customers from Netrakona and other districts but they don't come as much as before both because of security and financial reasons,” he said. LASER pointers are mainly used as aids in presentations for schools and businesses. But these are also sold as toys. These days a pointer can be bought for as little as a 100 taka. These can be a lot of fun especially when used at night around unwary people who usually become quite flustered. It's great for pranks but unfortunately in the hands of children it can be quite dangerous. A laser pointer emits an intensely concentrated beam of light that is so bright that it can burn the retina when pointed at the eye. This could lead to impaired vision or even blindness. Unfortunately most people do not know about this. Take a few precautionary steps in avoiding this danger. Inform the children or any other user about the risks and do not let a minor use a pointer unsupervised. They just might feel like checking out what the source of the light is. Also never shine the pointer at anyone or at reflective surfaces like mirrors that might reflect the beam into someone's eyes. 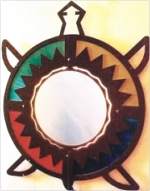 “Mirror ,Mirror on the wall, who is the fairest of them all.” The one thing that narcissists across the world probably love as much as themselves, is the mirror, a unique gift item. It might sound absurd at first giving someone a mirror as a gift but with some of the new designs and crafts attached to that simple piece of glass that mankind (read womankind) use to admire their looks, it aces as a present. I happened to come across some wonderfully articulate and intricate craftworks done in mirrors recently. Some had simple wooden designs and some had more intricate workings. Check our Aarong and you will almost definitely find something to your liking. As a kid I used to remember waking up in the morning to the tinkling of the wind chimes stuck to the door of my balcony. It was sweet melody and a sort of alarm clock, I didn't mind giving up my sleep for. Now before I go down a nostalgia trip be sure to check out Folk Bangladesh for some elaborately designed wind chimes. Although there is little wind in the apartment buildings that we have nowadays it serves as nice decor as well. Prices start from about Tk.200 or thereabouts. The Telecom Wars are in full flow. Aktel, Grameen, Banglalink, you name it, people have got it. With the holiday season beckoning each have developed their very own marketing strategy designed to defeat its opponent once and for all. So who are the beneficiaries? Of course it's the companies themselves, given the exorbitant prices that they charge for making calls. But in this case it works out well for us customers too because now you can get SIM cards for bargain basement rates. Go check out your nearest dealer and get that SIM card that you were longing for! For prices just open your newspapers! For those of us who are slightly more aware of our surroundings that the average person, the advent of this seasons Bangladeshi winter has not really surprised. For those of us who aren't, winter has announced itself in the worst way possible. Yes, you guessed it the flu. The season change flu usually afflicts more than its fair share of people and while it is not really very serious it can put paid to your busy schedule and at the same time be trying on your nerves. Here are some tips on how to prevent the flu and deal with them if you have already been affected. Many would probably scoff at this idea but if you are going somewhere near evening or night time and are traveling by rickshaw then its essential that you wear something warm or at least wear something to cover your head. It is extremely dewy during the evening and early morning and this can lead to you catching a cold in the blink of an eye. So be safe (and maybe a tad uncomfortable!) than sorry. No don't become a couch potato. Just don't shuttle too much between a warm place and a cool place. For example don't leave the cool air conditioned room for the kitchen too many times. Get the job done at once. Constant shuttling between warm and cool atmospheres usually lead to you catching a slight fever or cold. If you have already been afflicted with the flu then be sure to get plenty of rest and drink plenty of fluids. Medicine is good but too much medicine can also be hazardous. Try and avoid medicine for common cold and instead rely on natural drinks and fruits. Also take that time out you were wanting to for a while and get some rest. If you have a runny nose using petroleum jelly can ease the suffering. And if you have to have medicine take aspirin.